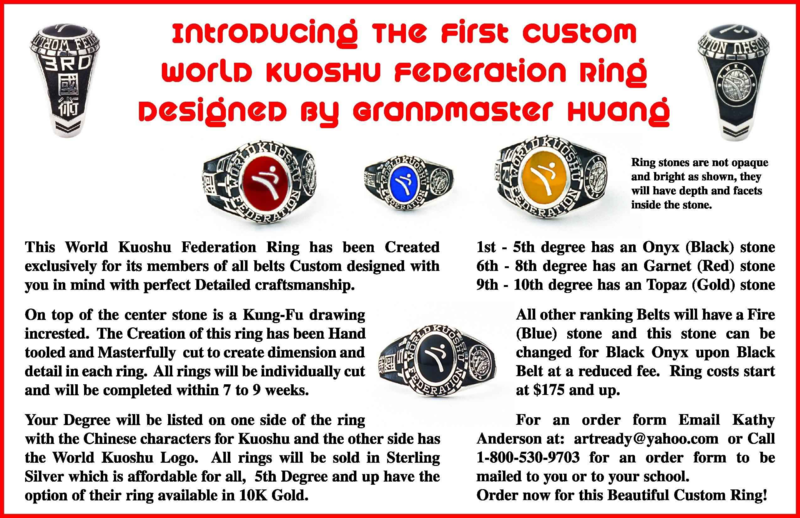 The World Kuo Shu Federation rings were designed by Grandmaster Huang. It is available in 4 stone colors, which signify degree. The rings are individually hand tooled and custom cut, a process which will be finished within 7 – 9 weeks from receiving an order. The rings are available in Sterling Silver for all degrees. A gold version of the ring is available for rings which are 5th degree and above. The left side of the ring has the numeric and character symbols for the degree level. The right side of the ring has The World Kuo Shu logo. The stones are faceted and the center has been inlaid with a Kung Fu figure. The stone colors indicate ranking. For degrees below first degree, the stone is a blue Firestone. First through fifth degree rings have a black, Onyx stone. Sixth through eighth degree rings have a red, Garnet stone. The ninth and tenth degree rings have a gold, Topaz stone. Ring prices start at $175. For an order form, email Kathy Anderson at artready@yahoo.com or call 1-800-530-9703 for an order form.